Taimur Ali Khan Pataudi is internet’s favourite baby. This little munchkin always wins heart and makes people feel awww. In fact, this toddler loves to get the photographs clicked. He is undoubtedly the camera-friendly baby. The little nawab and his adorable pictures are making us crazy again. On Sunday, he was spotted with father Saif Ali Khan, seems to playing badminton. Little Pataudi has worn a green T-shirt and a pair of blue denim shorts. The cutest thing you find is that Taimur is shorter than the racquet he held. In the image, Taimur and the people are quite happy. See the images. 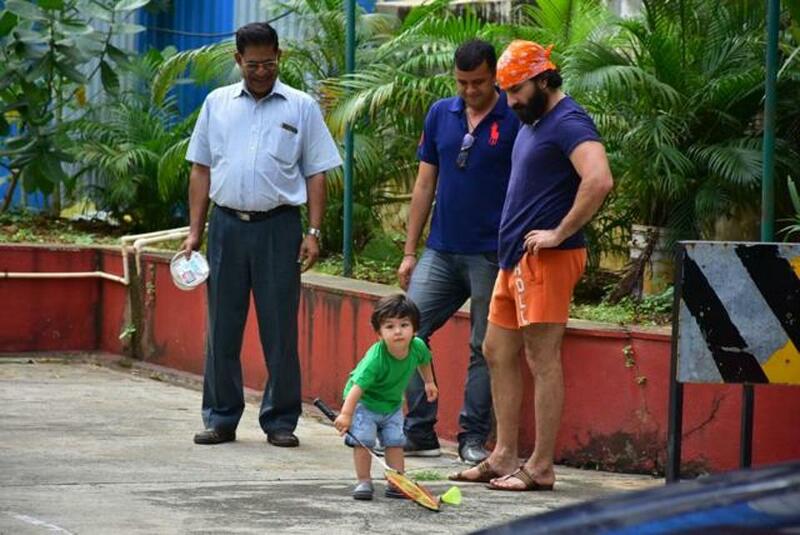 Papa Saif was spotted in a pair of orange shorts with dark blue T-shirt with his eyes on his little boy. Taimur and his father have been captured doing multiple activities. Taimur looked attentive as paparazzi was clicking him. In one of the pictures, he was looking directly into the camera. With his cute little gestures and love for camera, his entry in Bollywood in future can be predicted. He even loves to respond when his name being called out.